Having too much of something doesn’t always fit the bill. This is particularly true when it comes to the amount of moisture in your home. When excess moisture comes in for a landing, your space will feel hot and sticky. But here’s the thing: Your cooling system can’t reroute the problem. Instead, you need to force humidity to fly the coop by installing a home dehumidifier from Swanton Energy Services. Unfortunately, it gets worse. You see, when you feel hot and sticky inside your home, your natural instinct is to crank up your air conditioner. But no matter how low your thermostat is set, your cooling system will still fail to fix the problem. In fact, from your unit overworking to your energy bills spiking, this flight plan is doomed from the start. Rather than embarking on a wild goose chase to find relief from excess humidity, add a dehumidifier to your space. This humidity control system will reroute excess H2O out of your home to ensure comfort’s biggest enemy and your serenity never cross paths again. Plus, when you eliminate excess moisture, it reduces the strain on your air conditioner. This balanced environment makes it easier to retain your indoor temperature. Because of this, you can now operate your unit less frequently and set your thermostat to a higher temperature. As a result, you can feather your nest through lower energy bills and a longer lifespan for your air conditioner. Keeping excess moisture off of your home’s radar leads to a smoother flight toward total comfort. For a humidity level that fits the bill for your home and your comfort, fill out our online form or call us at 732-335-6731 today! Dampness, stickiness and odors are clear indications that your home’s air contains too much moisture. This makes for an uncomfortable indoor environment. If you find yourself here, turn to Honeywell. 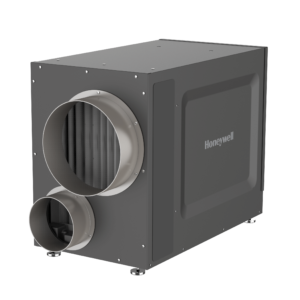 Installed in your home’s central heating and cooling system, this company’s TrueDRY whole-house dehumidifier effectively removes any excess moisture that’s lurking in your home. Plus, its integrated ventilation control introduces outside fresh air into your home. This system makes for a difference you’ll feel from room to room.